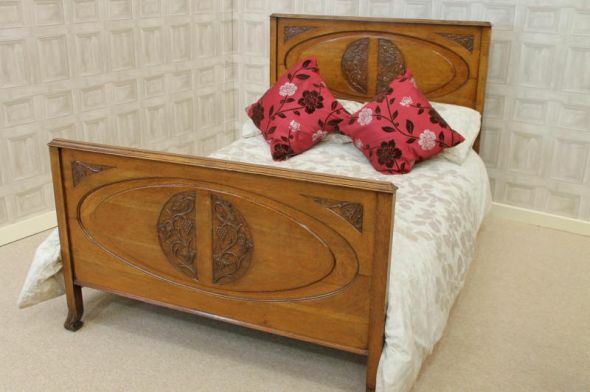 A beautiful example of a solid oak Art Deco bedroom suite. This suite comprises of a large double door wardrobe, a standard double bed, a chest of drawers and matching dressing table. All items are in lovely condition for their age, and fitted with their original handles. The bed comes with a newly made pine bed base, so all that is required is a standard double mattress. The bed also features decorative carvings to the headboard and footboard, which is also evident on the accompanying items. The wardrobe breaks down into four pieces for ease of transportation and reassembly. A superb suite which would make a fantastic feature in any Art Deco period house. This suite is now sold.